5929 E 82nd St, Indianapolis, IN 46250 Royal Indian offers American Indian cuisine with top menu items that include the Chicken Tikka Masala, Paneer Pakora, and Malai Kofta. Order online with fast delivery to your door! Naan bread stuffed with fresh garlic, cilantro & seasonings. Tandoori Tikka cooked with onion, tomato sauce & medium spices. Triangular crisp patties stuffed with spiced potatoes, green peas, and fresh coriander. Pieces of homemade cheese dipped in garam/chick pea flour and deep fried. Tender onions dipped in garam flour and deep fried. Pieces of tender fresh chicken dipped in garam/chick pea flour and deep fried. Wrap made of naan filled with chicken tikka, spices & onions. Wrap made of naan filled with potato pati & spices. A mixed salad of fresh greens. Fresh cucumbers, tomatoes & onions in a tangy dressing. Whole tender chicken leg portion marinated in yogurt and special spices & cooked in the Tandoor (does not include rice and naan). Chicken leg & thigh portion marinated in yogurt with freshly ground spices and lemon juice (does not include rice & naan). 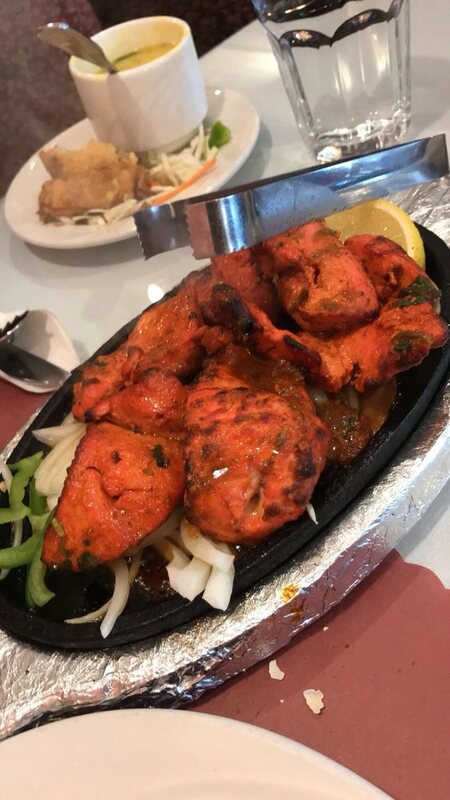 Tender boneless pieces of chicken breast flavored with spices and grilled to perfection in the Tandoor. Finger rolls of ground lamb spiced with fresh ginger, grilled in the Tandoor. Cubed Leg of Lamb marinated in Tandoori Masala and cooked in the Tandoor. Jumbo Shrimp seasoned with fresh spices and herbs, grilled in the Tandoor. Royal Chef's Special Recipe chicken breast, lamb, and shrimp, grilled in the Tandoor. Dip-fried bread made of all-purpose flour. Dip-fried bread made of whole wheat flour. Homemade Indian cheese cubes & spinach sauteed with spices and herbs. Homemade Indian cheese & green peas cooked in a mildly spicy sauce. Assorted fresh vegetables sauteed in herbs with almonds. Homemade Cheese stuffed in vegetable balls, cooked in a mildly spicy creamy sauce with raisins. Tender chunks of homemade cheeses cooked with tomato and butter sauce. Fresh vegetables cooked with spices featuring bell peppers & cheese in a sharply spiced sauce. Lentils cooked with fresh spices in an onion sauce & ginger. Baby okra sauteed with onions, tomatoes & spices. Eggplant roasted in our clay oven and then cooked together with chopped onions & tomatoes. Fresh Cauliflower and sauteed potatoes stir-fried with mild to medium spices. Chick peas steamed with tomatoes, onions, ginger, & garlic & spices. Fresh mushrooms cooked with tender green peas and spices. Delightful ragout of potatoes, spinach & tomatoes, light cream and spices. Lentils with freshly ground spices sauteed in butter, onions & tomatoes. Homemade Indian cheese cooked with onion gravy & tomato sauce. Homemade cheese cooked in green peppers with a touch of hot spices. Garam flour, yogurt & pakora cooked in onion sauce. Homemade cheese, onion & bell peppers with hot sauce. Chick peas with spinach, tomatoes, onions, ginger & garlic. Homemade cheese cooked in spicy sauce. Homemade cheese cooked in butter with mild spices. Boneless Chicken cooked with almonds with a touch of cream. Chicken cooked with spinach & fresh spices. Boneless chicken cooked in a hot and spicy sauce with potatoes. Chicken sauteed with ginger, onions, bell peppers, fresh tomatoes & spices. Chicken cooked with red & white onions and spices. Boneless chicken breast cooked in a spicy sauce. Boneless chicken cooked with green peppers. Chicken cooked with Royal Chef's Special Recipe. Chicken Pakora cooked with yogurt, tomato sauce, kari patta and soy sauce. Tandoori boneless chicken cooked in butter with mild spices. Lamb cooked with herbs and spices in gravy sauce. Lamb cooked with herbs and spices in gravy sauce with almonds. Tender pieces of lamb cooked with spinach and fresh spices. Lamb cooked in hot & spicy sauce with potatoes. Lamb cooked in spices with bell peppers & onions. Tender bites of lamb cooked in a special hot sauce with bell peppers, carrots & onions. Onion cooked Lamb cooked in a creamy sauce with fresh tomatoes and spices. Lamb cooked with shredded red & white onions. Lamb cooked with green bell peppers in a spicy sauce. Lamb cooked with almond onion gravy, hot sauce & yogurt. Goat curry with herbs & spices in gravy sauce. Goat with white onion, bell peppers & herbs. Goat & potato cooked with hot & spicy sauce. Goat prepared in vegetables with a touch of garlic & ginger. Shrimp cooked with onion, gravy & tomato sauce. Shrimp cooked in hot & spicy sauce with potatoes. Fresh fish cooked with spices in a thick curry sauce. Shrimp prepared in vegetables with a touch of garlic & ginger. Shrimp cooked with white onion & bell peppers. Fresh fish cooked with potatoes and fresh spices. Fish cooked with onion and tomato vindaloo sauce. Shrimp cooked with onion and tomato vindaloo sauce. Classic dish of curried rice with vegetables. Classic dish of curried rice with chicken & vegetables. Royal Chef's Special dish of curried vegetables, lamb & rice. Royal Chef's Special dish of curried rice, vegetables & goat. Royal Chef's Special dish of curried rice, vegetables & shrimp. Vegetables cooked with chilli garlic sauce. Chicken & garlic cooked with hot spices. Vegetables fried with rice & spices. Chicken fried with rice & spices. Chicken cooked with chilli garlic sauce. Naan bread stuffed with spices & onions. Naan bread stuffed with lamb, cilantro & onions. Naan bread stuffed with spices, coconut, cashews & cherry. Whole wheat bread cooked in the clay oven. Included choice of filling: Aloo (Potato), Paneer (Cheese), Gobi (Cauliflower). Special Indian drink made with yogurt and mango pulp. Special Indian drink made with yogurt & vanilla ice cream. Special Indian drink made with yogurt. Special sweet Indian drink made with yogurt and Royal Chef's Special Recipe. A famous Indian sweet made from milk & rice and flavored with nuts, raisins and cardamom. A North Indian sweet made from milk essence and soaked in honey syrup. Graded Carrots cooked in sweetened milk. Cookies & Cream, Vanilla, Strawberry or Mango.